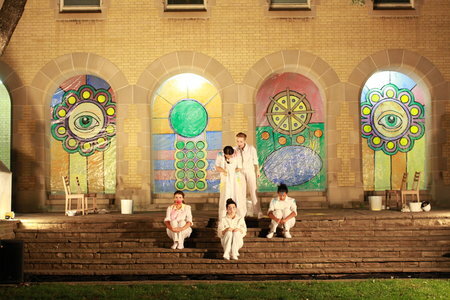 On Friday night, I made my way through a tiny door into a quiet quadrangle behind the University College building at U of T. There, the student-driven UC Follies Theatre Company performed an adaptation of Woyzeck for a very chilly but attentive audience. While the show itself raises some interesting issues and has been adapted multiple times worldwide, I felt that this particular production didn’t quite hit the mark it was aiming for. The set was simple, with five chairs and several buckets of paint and water placed in different locations around the otherwise empty stage. As we took our seats, we were encouraged to interact with the “patients” – all female, all in white – on stage before the show. The setting for the show was, evidently, an institution for women who suffer from mental illness in the ‘60s. Thankfully, that was explained in the program, as it wouldn’t have been clear from the production itself. While I absolutely agree that we should strive to discuss and explore mental health issues, and try to rid ourselves of any stigma associated with them, I’m not sure I agree this was the right production through which to do that. The script, left unfinished by its author Georg Büchner before his death, exists only in fragments and is often choppy and disjointed. Changing the setting and issues presented so drastically seemed to just make things more unclear, as it was very hard to follow the storyline. It was difficult to tell when something was supposed to be representative of each character’s stated mental illness and when it was merely a real conversation we were witnessing. I admit I had to look up the synopsis of the play once I got home, as my friend and I were left very confused and wanting clarity on many of the relationships and situations. The cast kept the action moving, though the staging felt very repetitive. Perhaps it was intentional and another way of showing the frailty of the characters as they suffered through their varied illnesses? I would have liked to have seen more of the beautiful, open stage utilized though. Willa Cowan made a notable effort to keep the energy up in her multiple roles, and I appreciated the different physicality and voices she used when switching between characters. Some of the other performers’ character choices were not as strong, and a few of the male characters portrayed in a way bordered on the stereotypical and offensive. There were some creative choices in the use of the paint, and while I appreciate what the director was trying to do, at times it was distracting. A few pivotal scenes in the show were performed while the actors had different coloured paint splattered on their faces and clothing, and I felt it took away from the impact and severity of the moments. The lighting and music were suitable for the outdoor setting, and the backdrop offered a welcome splash of pastel colours and brightness into the otherwise gloomy setting. This show was not for me, but the students should be commended for the time and effort they put into it. The ideas and concepts are there, and I truly appreciate the way they wish to bring mental health issues to the forefront of their production. Perhaps they will be able to do just that with a bit of polishing and some changes in certain characterizations. Woyzeck tells an important story that has the ability to leave audiences thinking. I can only hope that the next time I see it, I’ll be left thinking more about the issues it presents, and less about the issues inherent in any given production.